Lightweight & Comfortable Rest assured this comfy vest will pamper your precious pet. With its ergonomic contours, it feels like it's barely there. Plus, with its breathable padding material, it helps prevent rubbing & chafing. Not Just for Service Dogs. Own a therapy or support dog? Or any other working dog? Just remove our 2 "Service Dog" patches & replace with 2 of your own(Service Dog In Training, Therapy Dog, Do Not Pet, Emotional Support etc). One vest. Endless possibilities. Order NOW for Yourself & All the Working-Dog Owners You Know! Comfy. This lightweight vest is padded for non-chafe cushioning.Service dogs will hardly feel it. 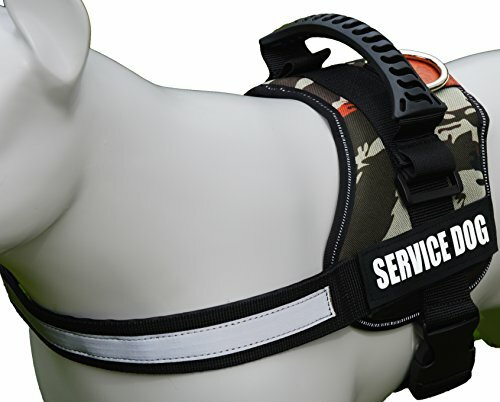 Service Dog harness has adjustable belly strap. Size M will accommodate girths from 24" to 30"
If you have any questions about this product by ALBCORP, contact us by completing and submitting the form below. If you are looking for a specif part number, please include it with your message.